In this article we’ll explain what can cause buffering and bandwidth problems during a broadcast. Bandwidth is the capacity of an internet connection, and you can more or less think of it as the speed of you internet connection. Broadcasting live audio requires a fairly good internet connection. 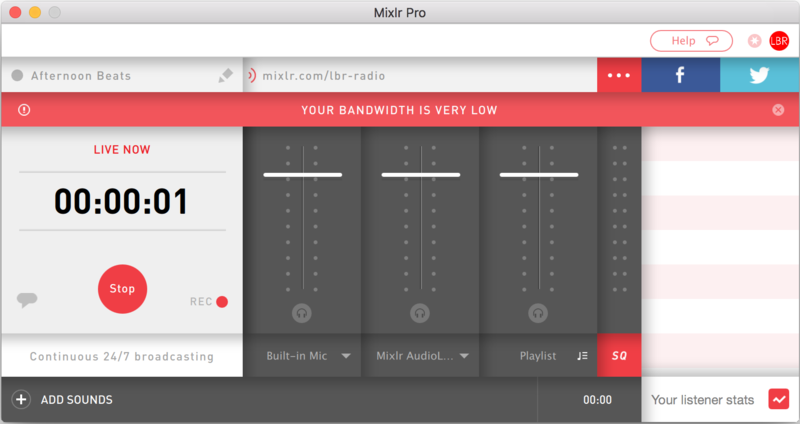 If you receive a low bandwidth notification when you’re live your listeners may experience a pause in receiving the audio. The two most common causes of low bandwidth are a slow internet connection provided by your ISP, and uploading files or running file sharing and torrent software whilst broadcasting live. If you’re experiencing low bandwidth issues we would recommend quitting any applications which could be taking up your bandwidth. If you’re not running applications which may be doing this, try running a connection checker on your internet connection. We recommend an available upload bandwidth of no less than 60kb/s. Buffering is usually caused by insufficient bandwidth at either the broadcaster's or the listener's end. If only one or two of your listeners are experiencing the gaps, then they may not have enough bandwidth to listen to the live stream without it occasionally buffering. If many of your listeners report gaps then the problem is likely to be insufficient bandwidth at the broadcaster's end.